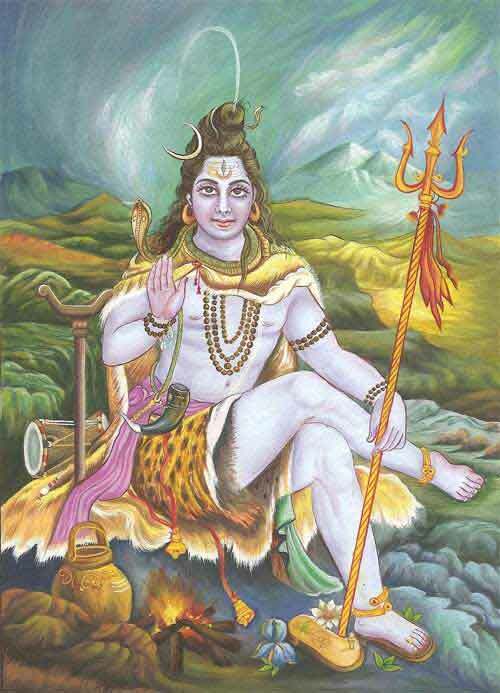 Numerous symbols and things are exclusively associated with Hindu god Shiva. These attributes of Shiva have hidden and universal meaning. 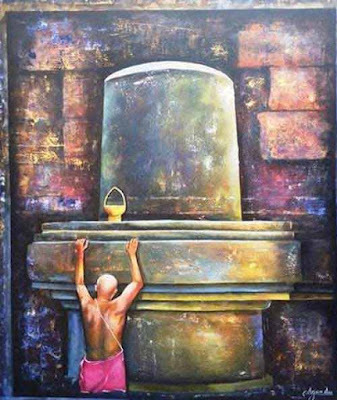 Shivling – This is the universal symbol of Shiva. Shivling is the symbol of that which is formless and without attribute. The Supreme Truth takes form to satisfy the urge of his devotees. Yoni Bhaga or Yoni-patta – pedestal of Shivling - symbol of creative energy. Chandra – crescent moon. Symbolically reminds about the cycle of creation, sustenance and destruction. Like the moon, the universe undergoes cyclic creation and dissolution. Ganga – River Ganga – It symbolically represents life and all life is connected to Shiva. 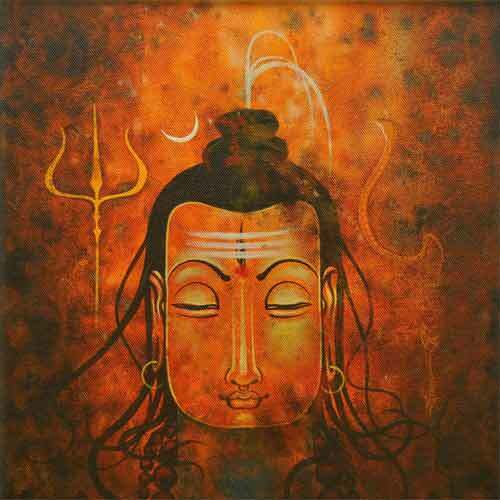 There is nothing outside Shiva. Karpada – jata – matted hair – symbol of connectivity with nature. Tripundra – sacred mark – symbol of creation, sustenance and dissolution worn by Shiva devotees. Rudraksha mala – Rosary of rudraksha beads – tear of Shiva on seeing the suffering due to ignorance on earth. Kapala Patra – Skull Cap – Death is nothing but a mere transformation to another form. Kundala – Tatanka – Male and female earrings – Male and female are both same and appears from the Supreme Truth – Shiva as Ardanarishwara. Damaru – hourglass drum – marks the beginning of creation – the primordial sound. Creation begins when Shiva strikes the hourglass drum. 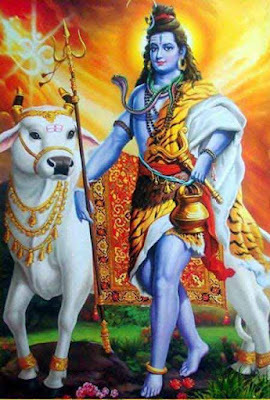 Bilva Patra – Bel leaves – Shiva is the knower of past, present and future – life represents life of a living beings – birth – existence and death. 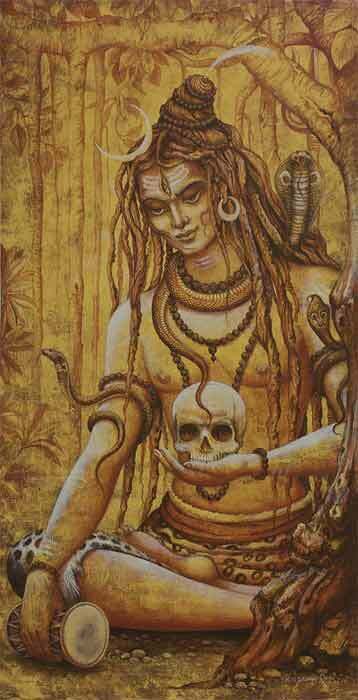 Shiva is in control of all the things. Dhara Patra – Water pot – constant reminder that human beings are part of nature not above it. Neelkanth – blue neck – infinity – it is a symbol of the infinite. Mundmala – Garland of heads – reminds about the meaninglessness and fickleness of everyday life wasted on fulfilling desires. Lakuli – staff – symbol of authority of Shiva over the universe.